Now it’s easier than ever to cut the cords and go wireless – even if you’re not familiar with Bluetooth® technology headsets. The Jabra BT2080 is designed with one focus only: To be the most user friendly, quality headset on the market. Jabra StatusDisplayTM with two intuitive and clear LED’s on the back of the headset shows when to recharge the battery and your current connection status. A dedicated on/off button makes it easier than ever to turn the headset on and off. Just switch the button, and you’re on. Jabra BT2080 is easy to connect to your phone. With the latest Bluetooth® technology version 2.1 you don’t have to worry about pin codes. Wear it as you like: Over the ear with an ear hook or in the ear with Jabra Eargel that add comfort to all your conversations. Talk loud and clear: The Jabra BT2080 picks up your voice and delivers clear quality audio to the listener through EDR & eSCO technology. 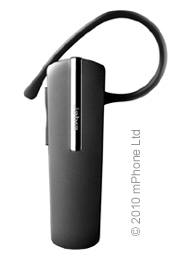 Well designed quality headsets simply don’t come easier than the Jabra BT2080.